The current campaign to create a faculty union at Pitt focuses on a host of issues, including job security, benefits and wages. Union supporters also want to figure out who owns the PowerPoints they make. 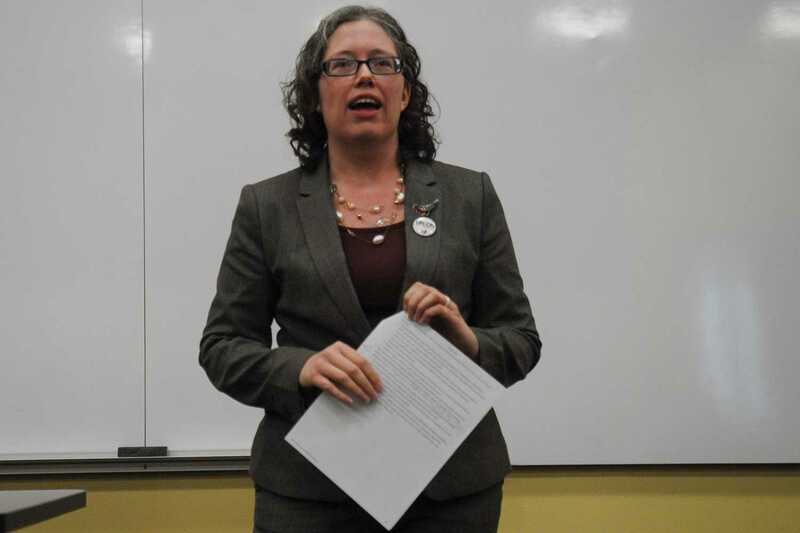 A group of about 15 gathered in David Lawrence Hall Tuesday afternoon to have a panel discussion on intellectual property rights for Pitt faculty members and how those rights tie into the formation of a union. The Pitt Faculty Organizing Committee hosted the panel. Organizers have focused on intellectual property in their campaign to create a union. According to their site, organizers are calling for a union contract with the University specifying what rights Pitt faculty has in regards to the material they create. Pitt policy on patents says the University can claim ownership and control of the intellectual property rights which result from activities of its faculty, staff and students. If the inventor or another institution believes the circumstances warrant another action, they can request a review. The University’s copyright policy maintains that authors affiliated with Pitt retain copyright ownership in any material which is a copyright work in the author’s field of expertise. But the University does retain a “non-exclusive, irrevocable, perpetual, royalty-free license” for course material a faculty member creates at the school. The panel brought four guests together to discuss the topic. The guests included Jacob Rooksby, Gunduz Caginalp, Lauren Collister and Robin Sowards. All the panelists supported the creation of a faculty union and an examination of intellectual property laws at Pitt, but each had different ideas about how to approach the issue. Rooksby, the associate dean of administration at Duquesne law school, said his stance was that faculty members should have more flexibility to choose if they own something or grant the University ownership instead. Caginalp, a professor in Pitt’s mathematics department, also argued against the University’s ability to claim ownership over individual intellectual property, pointing out that if a professor does work on their own time they don’t receive a raise for it. Though faculty can challenge Pitt’s ownership if the discovery was made without the support of the University, Caginalp believes that the only way to fix this is to unionize and negotiate with the University. Sowards, an adjunct lecturer and researcher at Chatham’s English department, sided with these arguments, and mainly focused his discussion on what should be done once a union has been created. He discussed several different routes a union could take, including negotiating specific intellectual property policy language in a collective bargaining agreement or negotiating a joint faculty-administration committee to create, enforce and revise policy language. Collister, the University Library System scholarly communications librarian, was also a strong proponent of unionizing, but she argued that allowing the University to own some of the faculty’s intellectual property was better than handing over information to for-profit journals, something professors have to often resort to. Collister said these journals often do very little with the information given to them, but simply sell it back to universities. She said unions should be created to negotiate changing promotion and tenure policies so that professors are in better circumstances to adhere to University policies regarding property rights. Collister believes that there should be greater support for open-access journals so that more people can access articles. Irene Yelovich, a patent and trademark librarian at Carnegie Library, said she came to the panel because she was interested in intellectual property issues and also wanted to learn about the union organizing going on at Pitt.